For a major action starting in the UK today, 15 April 2019, the organisation has released a series of banners, flags, patches, posters and stickers for activists to download and use, to help spread the word about the movement and its aims. "We needed to create a movement that looks radically different to all eco movements previously, because they failed," Clive Russell, a member of Extinction Rebellion's art group told Dezeen. 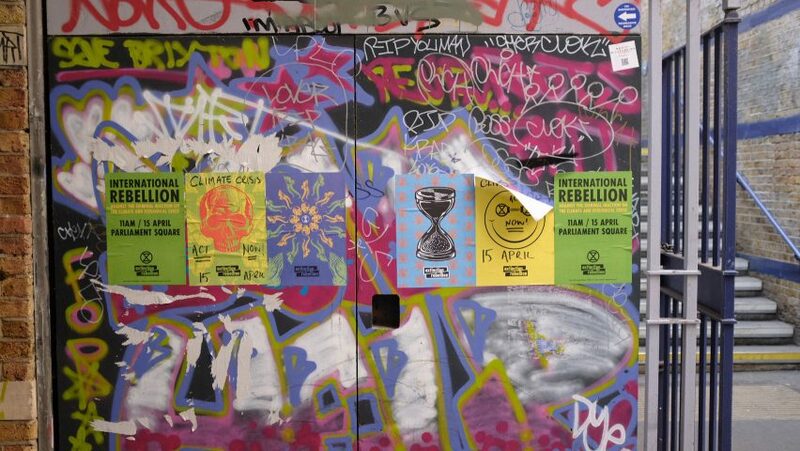 This included flyposting – a form of guerrilla marketing where posters and signs are put up illegally, often using wheat paste as glue. All Extinction Rebellion's posters use an original font type set against a bright background, and all the designs work from a palette of 10 specific colours. "We wanted to use a breadth of colour to highlight the intersectionality of the movement. Obviously, we had to use green. You can’t be an eco movement and not use Green," said Russell. "The font is based on an old wood type. We took something retro and made it modern. The lettering is slightly mismatched. We always tried to reuse as much as possible," he added. The Extinction Rebellion logo is created by a designer who wishes to remain anonymous, communicating only through the Extinction Symbol website. It is a stylised hourglass inside a circle that represents the planet, symbolising time running out. This references the warning from the United Nations that we have just 12 years to limit global warming to 1.5 degrees Celsius, or risk catastrophic changes to the planet's climate. Animal bones, bees and eyes are recurring motifs, representing the threat of species extinction, colony collapse and wilful blindness to the urgent threat that climate change poses to life on earth. A recent scientific study published in the Nature Ecology and Evolution journal has estimated that it would take millions of years for the earth to recover from the current levels of mass species extinction. The unifying motto of every self-selecting member of Extinction Rebellion is "Rebel for Life", a double entendre intended to underscore both the activist's commitment and the mission of reversing mass extinction. "[It] captures both our aim and inclusivity. There are people who want us to focus on climate change or veganism. They might call us vague, but we are all of these things," explained Russell. "The more important political point for us is simply to highlight the scale and urgency of the climate crisis we face." There are no leaders in the movement, which operates with a flat hierarchy, and there is a strict ban on commercialising the symbols and designs it has created. "We are a catalyst for change, rather than a particular campaign," added Russell. "We are not saying how we should change, we are presenting the need to change. We are advocating that people tell the truth and act on that truth. We are asking for a citizens’ assembly to decide the way forwards." Extinction Rebellion's activists are staging a series of actions across London all this week. This will include marches, plus blockades across roads and bridges. Designers around the world have also been joining the cause of campaigning against climate change. Fashion designer Vivienne Westwood sent models wearing slogans berating politicians down her catwalk for London Fashion Week in February, and New York's Cooper Hewitt is dedicating its Design Triennial to the issue of climate change. Meanwhile a pair of Finnish artists recently installed a line of lights around coastal towns in Scotland to visualise the catastrophic potential of climate change.